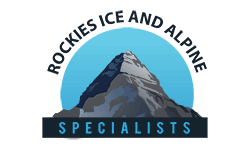 Rockies Ice & Alpine Specialists is unique in our exclusive focus on ice climbing, rock climbing, and alpine climbing. Every new season is as exciting as the last, and brings with it the opportunity to challenge oneself on different terrain. Owner of RIAS and lead guide Kristopher Irwin is a certified Alpine Guide by the Association of Canadian Mountain Guides and is a certified level 2 Rope Access Technician with the Society of Professional Rope Access Technicians (SPRAT). He holds current Wilderness First Aid Training of 80hrs, and has completed the Canadian Avalanche Association’s Operations Level 2 program. He has climbed extensively throughout the Canadian Rockies and abroad. He has made numerous first ascents on new routes and unclimbed peaks in North America. 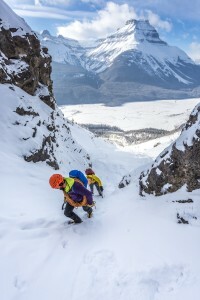 He is most comfortable climbing winter ice and mixed routes on formidable peaks in Canada during the winter months. He also has reputation for cooking up some tasty backcountry meals! The ACMG is a professional association of trained and certified Mountain Guides, Specialty Guides, Hiking Guides and Climbing Instructors. They are the only recognized professional association in Canada. When hiring a guide in Canada, please verify if the guide or instructor is a member of the ACMG. You can do that here. Being active and dialed into local route, weather, and avalanche conditions ensures we can offer the best day out on the right climb every time. Our guides excel at the sport, and their natural psyche is contagious. Each climb is as much a journey as a destination. Our philosophy is to provide personalized guiding service that transmits the excitement and passion of our guides and the sport to first time climbers and returning expert clients. Our primary priority is continually the health and safety of our clients within the context and environment of the activities we pursue. All of our guides are certified with the Association of Canadian Mountain Guides, carry Provincial/National Parks permits and insurance. Thanks to our many clients who return year after year, and welcome to those of you who will join us for the first time this season.